From what we can tell, the Gladiator-based concepts will show off ideas old and new. Jeep people are unique, and as such, so are their yearly get-togethers. Instead of endless rows of cars in a parking lot, they hit the trails. The annual Easter Jeep Safari, held in Moab, Utah, promises nine days of trail riding and adventure, miles away from the distractions of everyday life. The event was started in 1967 by the Moab Chamber of Commerce and has grown steadily since then. FCA/Jeep has been involved for several years now, offering not only support but getting in on the fun themselves. Each year, they develop concepts to debut at the Easter Jeep Safari instead of at auto shows in Detroit, New York, or Los Angeles. They've teased us with a pair of photos showing details of the two concepts they intend to debut this year. The first shows a blue Jeep, focused on the driver's side door and part of the hood. A closer look behind the door reveals this to be a Gladiator and not a Wrangler, built with a single cab. We're hoping it's a short-wheelbase Gladiator. The retro-styled Jeep fender badge is accompanied by a "J6" badge, which is likely a nod to Jeep's J-series pickups of the '70s. Those trucks, which were known alternately as the J10/J20 and Gladiator, lent their name to Jeep's newest model. We're eager to see what other retro touches have been added to the Gladiator for its debut. 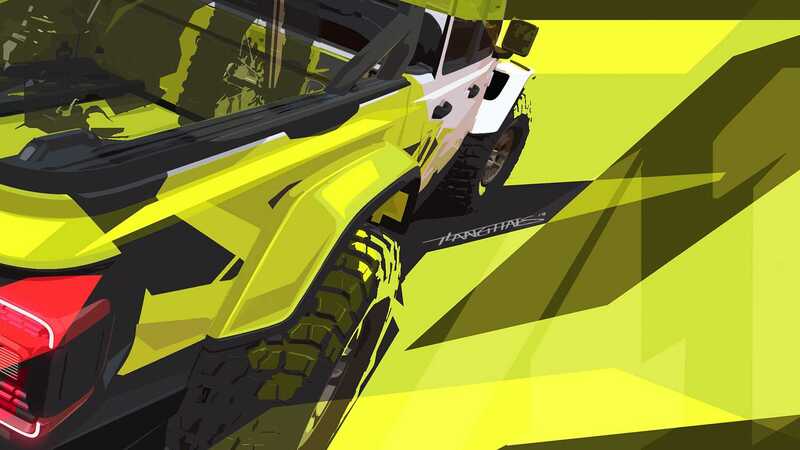 The other concept teaser is a rendering in alternating shades of black, white, and highliter yellow. It shows a Gladiator – this time with four doors – from the rear. From what we can see, it's got big flares, bigger tires, and an roll bar in the bed, a classic touch that you don't see on pickups much anymore. We'll know for sure when the concepts are unveiled at this year's Easter Jeep Safari, which runs from April 13th through the 21st.